Boker Magnum Sgian Dubh Fixed Blade Knife | BUDK.com - Knives & Swords At The Lowest Prices! 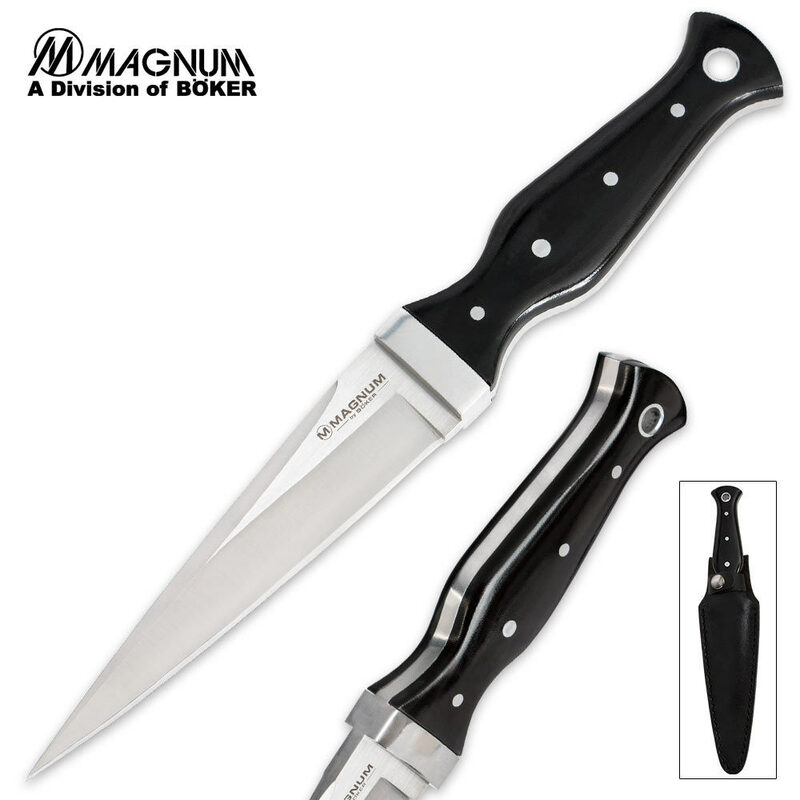 Boker offers its take on the traditional Scottish stocking knife in the Boker Magnum Sgian Dubh. 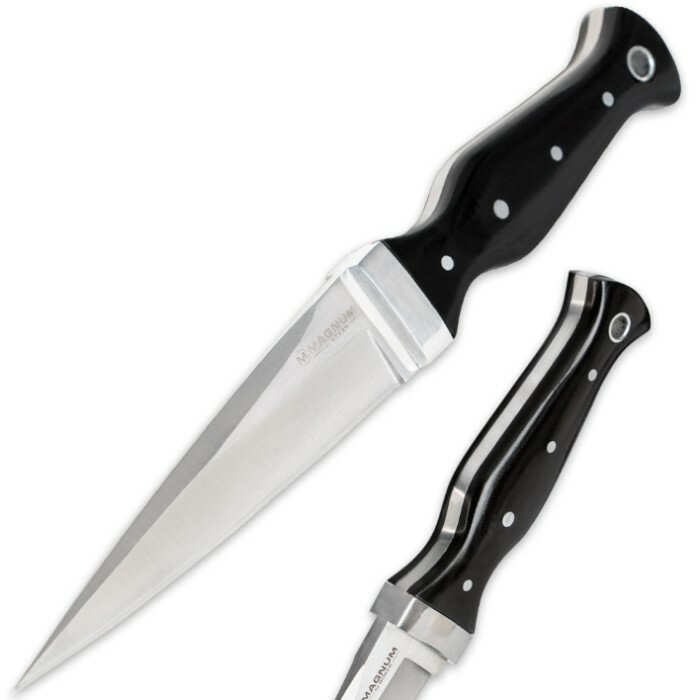 Boasting hefty, full tang 440 stainless steel construction, this modern interpretation features a dagger style 4 5/8" blade with a piercing point and sharp edge. Black Micarta handle scales encase the tang for a firm grip and attractive contrast to the handsome blade. 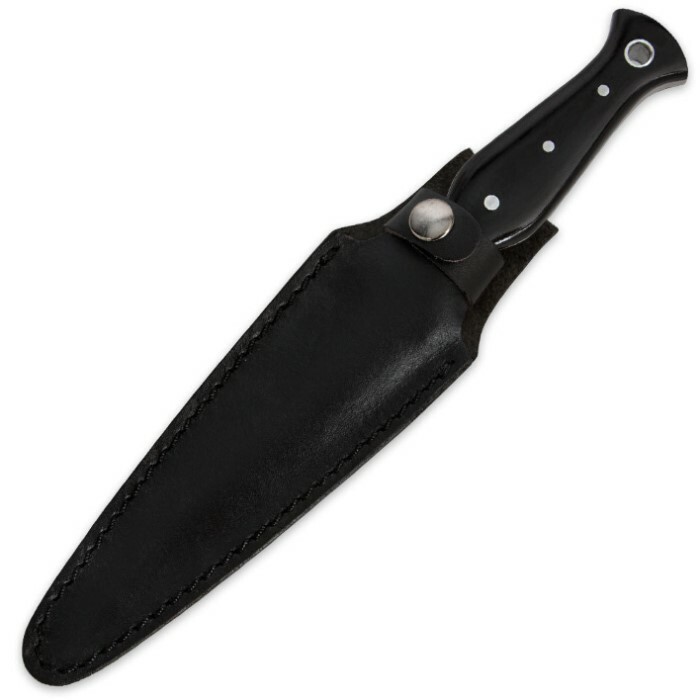 Includes a black leather sheath. Blade and finish were excellent only compliant is with the sheath, belt loop is to thin for every day wear mine ripped and broke in less than a couple weeks ! Boker / Magnum really has the knife making process dialed in fine tuned to wonderful products. ... I've got a few Magnums by Boker, and every one of them has excellent details, sharp as can be, needle tips on the daggers. On the first day, since the Sghian Dubh is so highly polished and smooth, I dropped it. ... My new dagger BOUNCED off the table, wizzed past my leg and stuck in the couch about 2" deep. ... For now the sheath is adequate. ... I'll be adding a sheath or two, to make it easier to carry in different situations. Shiny and slippery, sharper than any blade I own, and Boker / Magnum makes an awesome product.... this knife will do exactly what it's designed and built to do very well. All in all a really good looking dagger style knife. Fit and finish is right on. My only complaint is with the sheath. While the main part of the sheath is good and thick, the belt loop was made too thin and there's a folded plastic removable liner in where the blade goes. The belt loop looks like ones on a really cheap imitation leather one and the look of the material of the whole sheath looks like imitation leather. They need to improve that part at least. .I may have to buy a different sheath for this...I don't know if this one will be satisfactory for me.